For the purpose of this post I could have started with “It is hard to imagine photographers that are more different than Garry Winogrand and Robert Adams”. But actually it is not very true. You can surely oppose Winogrand to the other Adams (Ansel), or Robert Adams to -say- Yousuf Karsh etc… for what is worth. But in the case of Winogrand and Adams (Robert), there is an identifiable lineage that makes their work not so totally remote from each other. Could be the Walker Evans legacy, both of them taking distinctive part of it and pushing it forward. As far as I am concerned I am no expert so I won’t bother to develop any idea in the like. But since I have often found in looking at Henry Wessel pictures that they borrow from both Robert Adams and Garry Winogrand I tend to think (or better said feel) that they would be not so far from each other if one would map the Topographic Relations in the history of photographers. Anyway close or not as they could be from an historical point of view they are probably men of different temperament and their respective photographic instincts differ much. And although both arguably share a pessimistic vision of the World a key difference I see is in the speed at which they see it (the World) moving. Frenetically in the case of Winogrand, slowly and somewhat ominously for Adams. In musical term it is a bit like comparing Charlie Parker to Jimmy Giufree. 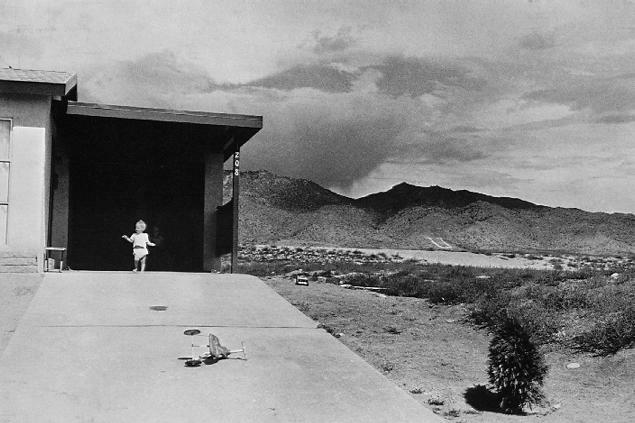 But all that has no importance in the fact that one day of 1957 Garry Winogrand grabbed that snapshot of a toddler on the driveway of his parent’s house in the outskirts of Albuquerque, New Mexico. I already mentioned that picture in this post. To be honest I find it a shame to feature twice the same picture in a photoblog, after all there are so many out there. But in the meantime I discovered this one from Robert Adams whose similarities with the Winogrand picture struck me. I don’t know when Adams did that shot. It was probably ten years or more after the one from Winogrand. Now what strikes me about the two photographs is not that they look alike (actually they do not look alike), but rather that the second one is like the same subject matter resurfacing few years later, though not literally of course because the place is presumably different. 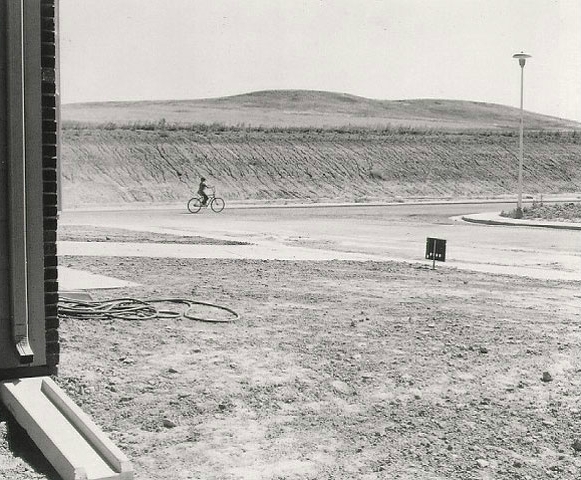 In his post about the Winogrand photograph, Joe Van Cleaves (who rediscovered the exact location of the shot) explains that “The city of Albuquerque was undergoing explosive growth in the 1950s, and this now forgotten tract home, lost somewhere in the midst of a mature metropolis, was back then on the very edge of town, tentatively tethered to civilization by the tenuous threads of barely paved roads and utilities stretched thin.” And I think it is exactly what the picture from Adams shows : tenuous threads of barely paved roads that tentatively tether this very edge of town to civilization. In fact all in the shot works like a continuation of the Winogrand picture, both in the topographic and timeline. New roads have been seemingly traced, a streetlamp has been posed, the house is new, the kid from the Winogrand picture has grown up and he has got a bigger bike. Yet development of the area is still underway and we can see some hills looming on the horizon – though much softer than the one from 1957. Whereas in the 1957 image there is an emphasis on the toddler going outside home for his bike (an allegory for Winogrand own childhood ?) the image from Adams insists on the edgy character of the location. The house is brand new but barely visible and is facing disparate and scarce items of the neighborhood under development, slowly but surely swallowing the desert beyond the artificial mound elevated as a temporary frontier between civilization and the wildness. 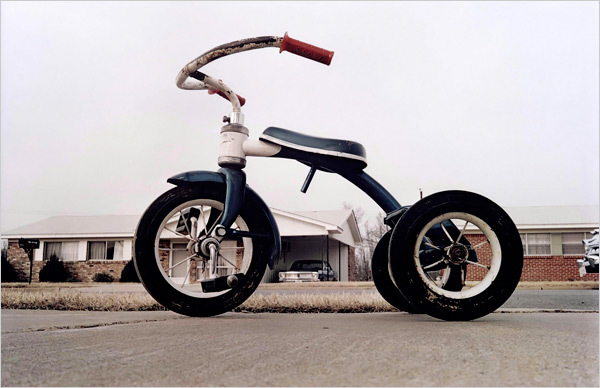 There is another photograph, very famous, that could be related to the two pictures above: the one of a tricycle from William Eggleston. By “related” I mean that it can be seen as a development of the story sketched in the two other images. There is something threatening in that photograph as a standalone piece. Recently there was a story about a young boy kidnapped on a french news website and the photo chosen to illustrate it was that of a similar kid’s bike left alone in a street of a similar neighborhood. But when you look at the photograph in the context of the original book (“William Eggleston’s Guide” from which it is the cover) you have less of this impression. By that I essentially mean that the image within the book is more neutral emotionally, more aesthetic (in the sense of Eggleston peculiar way of seeing things through a viewfinder), but also more mysterious in some way. Now if you consider the image in sequence with the Winogrand and Robert Adams shots there is yet another way of seeing it. Still the same subject matter resurfacing, but this time in color and with a notable difference in that there is no more kid, but the obvious foreground bike instead (interestingly enough the bike is technically a tricycle, as in the picture from Winogrand). Considered in the sequence of “New Mexico” the image from Eggleston is both less and more elusive of subject matter. Less elusive because it is very straight forward in showing the bike like that, taking huge and distorted proportion from that vantage point. More elusive if we consider the fact that there is no more kid in sight, as if the obvious presence of the bike is enough for suggesting the presence of the child in the area. But what can be seen as a hint of the kid’s presence nearby can all the like be interpreted as a clue for his very absence. Maybe the boy has become a young man, he has left his parent’s home. And now the bike is deserted and stands here as a give away waiting for another young owner – and the reason why it is shot so prominently could be to fixate it before it definitely disappears. Other difference in the image is the house behind with its few ornamental shrubs. Compared to the previous shots it seems clear that the neighborhood is no more that edgy and precarious settlement tenuously connected to civilization that was shown before. Now we are in the middle of the civilization and the Wild – like the kid – is no more in sight. Of course there are numerous possibilities of further development of the sketched “story” here. But in photography I believe more in the relative stillness of “subject matter” rather than on the idea of “story” and I want to be brought back to the original scenery. I found that in the book “27 Good byes” by Deanna Dikeman (also see this post on Blake Andrew’s Blog) and especially in the photograph below. It is a sort of negative, inverted version of the 1957 shot from Winogrand. Not only the scenery has been flipped horizontally (with the driveway now on left) but also everything is now substituted: There are trees behind in place of the rocky hills, the parents stand now at the very same the place that of the New Mexico toddler. 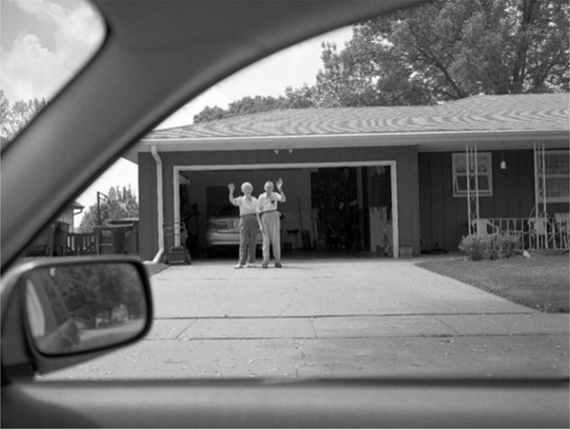 In the Winogrand shot the deep black garage behind is like a womb from which the infant emerges. Here it could evoke life accumulated by this very family in that very place (*). The parents are waiving good-bye to the driver who is the kid that has grown up and who makes the picture himself (I should say “herself” in the context of the book) from the car which has now taken the place of the forsaken bike. The wing mirror invites the viewer to look backward in time, or more specifically it allows us to take the approximate vantage point of the Robert Adams picture. But what it shows is just blurry bushes that now block the view from what was an open and uncivilized space long time ago. Time to say Good-Bye. (*) A similar – but sinister – vision lies on the final sequence of David Lynch movie “Mulholland Drive” that leads to Diane’s suicide, when her parents (or tutors) are emerging from the darkness of the blue box.